This recipe is so ridiculously easy...and also a total ripoff at that...it feels a little awkward even posting it, except that I want the reminder of the simple goodness. Besides, since becoming a mom, it seems like EASY is the goal in most things. If there's a shortcut that buys me time, I'll take it. Originally, I planned to make this beautiful side dish from Oh She Glows for Thanksgiving, only I went cheap(er) and didn't buy nutritional yeast. I was debating adding all kinds of things to the nutty topping to create something new. Then it finally hit me that the whole point of the nutritional yeast was to add a parmesan-taste, and duh, I could just sprinkle parmesan instead. I love vegan food but I'm not actually a vegan. 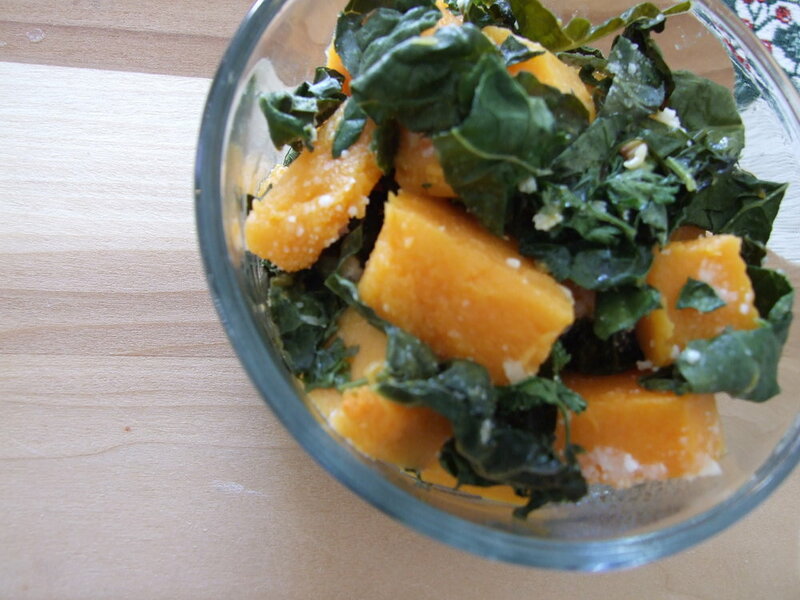 So there you go--easy side of roast butternut squash cubes tossed with lightly roasted kale, some olive oil and sea salt, and sprinkled with parmesan and parsley. So easy, I almost feel guilty. Only why should I when nothing is in fact easy these days? It's not easy chugging along on fewer than 6 hours of broken sleep night after night--on a good day. It's not easy fitting in half of what I hope to each day, or managing to tone down the rising stress bubbles that come alongside so little getting done. It's frustrating feeling obliged to be grateful for the odd half hour here and there to accomplish free-handed tasks like fix dinner, take a shower, or get a little freelance work done. It's awfully hard too, when frustrated, to be pleasant, especially to my poor husband trying his best to help and support. Sometimes I do indulge in feeling sorry for myself, hauling my way to the treadmill at 4:30 am or so because that's when I'm most likely to fit in a workout. I know that sounds like a whiney rant...and I guess we can call it like it is. On the other hand, some things do come along naturally and with ease, in ways we can't prepare for. All I have to do is look at Felix, for example, and my heart could burst with the most enveloping love I never imagined. And the passage of time takes us by surprise; one day, not only has something started to click, but the rough patch that seemed endless is not only over, we long for it back. Pregnancy has somehow created big strides forward in a decades old quest to be more patient and more positive with myself, too. For once, in recovering post c-section I let myself listen to caution even when I was itching to do more. Now I can say with real certainty that patience does pay off. On Thursday I jumped into the local turkey trot last minute, my first 5K since baby. It's early days, and I haven't been doing real "training". I expected my pace to be something along the lines of 8 minute to 8:30 pace, but when I went through the first mile in 7:16 feeling fresh and good, instead of thinking "oops, I blew it", all I thought was "I guess I can handle this now". And actually, throughout the whole run, my only thoughts were: a) about enjoying the privilege of being out there participating in an event again, and b) how I love Felix. I'm not saying by any means that a child is life's answer, and fulfillment comes in many forms. But for me, looking back on past searching and time lost in fog, I can now see a Felix-shaped void. This morning I looked at Little Monkey cooing, ah-gooing, rolling, grabbing, giggling, and chatting, and it hit me that my baby is already becoming a proper little boy. As much as I yearn at times for a little more freedom, I'm already missing the baby. I'll embrace as many easy options as I respectably can to enjoy him while he's here, and be part of each and every step. *I don't make roast squash dishes the most conventional way, but it does work for me! I just toss it in the oven for about 30 minutes or so when I'm already baking, until it's tender enough to easily peel and cut into cubes when I need it. 1. Peel and chop the squash into chunks. Place in a 9X13 baking pan or casserole dish and set aside. 2. Heat olive oil in a skillet and brown garlic. Toss with kale and sea salt to combine, then add mixture to baking dish. 3. Sprinkle casserole with parsley and paremesan and bake, uncovered, at 350 F for 15 minutes.